Type and Characteristics: Barquentine-rigged steam cutter (above, circa 1900), built by William Cramp & Sons, Philadelphia, PA at cost of $196,500, composite construction with wood on steel hull, commissioned 12 December 1897, 1,280 tons displacement, 219ft long x 33ft 4in beam x 14ft draft, triple-expansion steam engine, 21 1/2in, 34 1/2in and 56 1/2in diameter x 30in stroke, 2 boilers, 200 psi, trials speed 17 knots, armed with 4-3in guns/1 torpedo tube, crew of 130 (wartime - but 12 officers and 67 crew, total of 79, listed during Spanish-American War (see below)). Rig later reduced to two "military" masts. 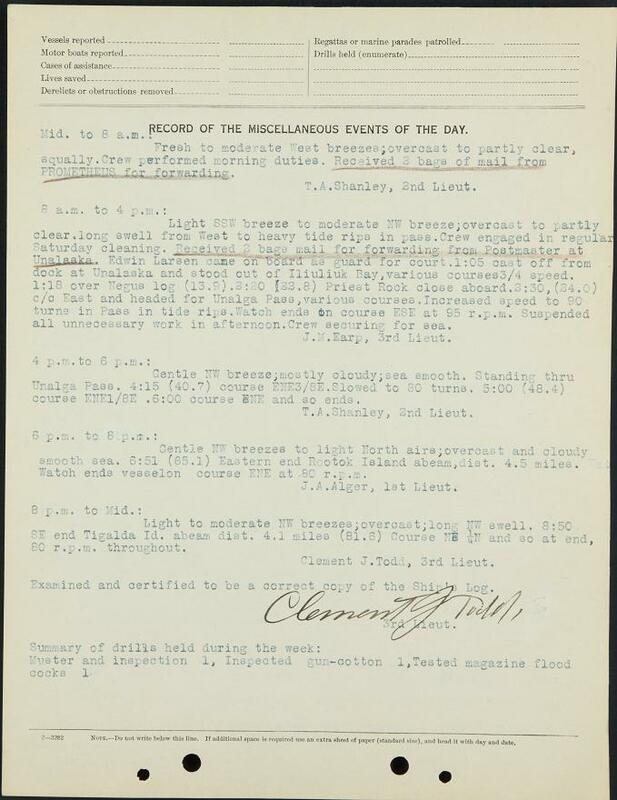 Log Period and Areas of Service: 1897-1917, Spanish-American war service, West Coast of US, Alaskan waters. 12 December 1897 - Commissioned under command of Captain D B Hogsdon. 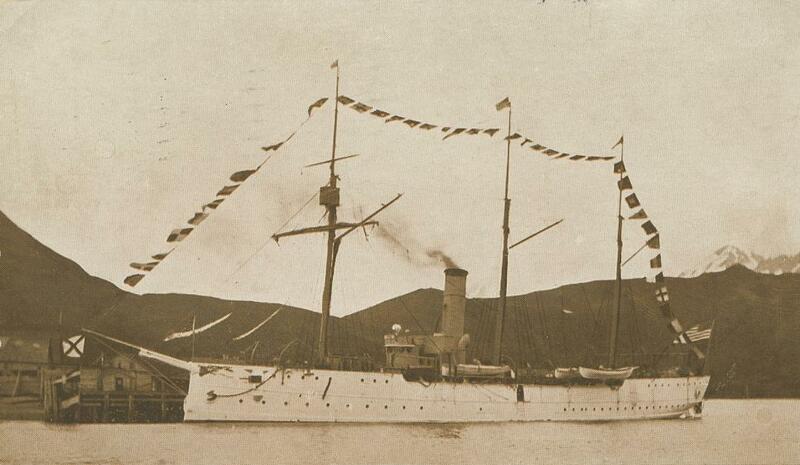 1898 - Steamed via the Suez Canal for her first station at San Francisco. 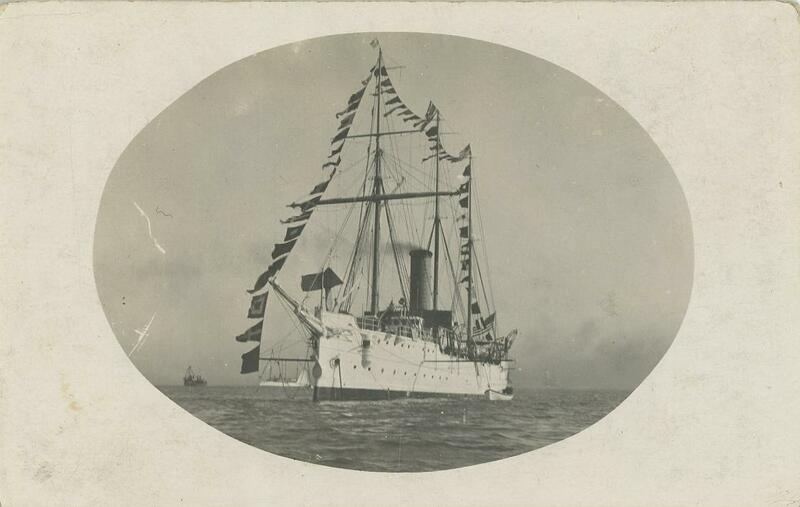 8 April 1898 - Arrived at Singapore. 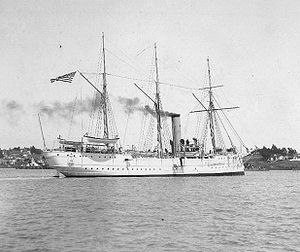 With the onset of the Spanish-American War, ordered to join Commodore Dewey's Squadron on the Asiatic station - cruisers Olympia, Boston, Baltimore, Raleigh, and gunboats Concord and Petrel. McCulloch's role included escorting storeships Nanshan and Zafire. Entered Manila Bay the evening of the 30th, having departed Mirs Bay, China on the 27th. Dewey's Squadron successfully defeated the Spanish fleet, but on the way in, McCulloch's stack caught fire and Chief Engineer Frank B. Randall died from the results of tackling the blaze. Captain Hogsdon was commended by Commodore Dewey for "the efficiency and readiness of his ship". 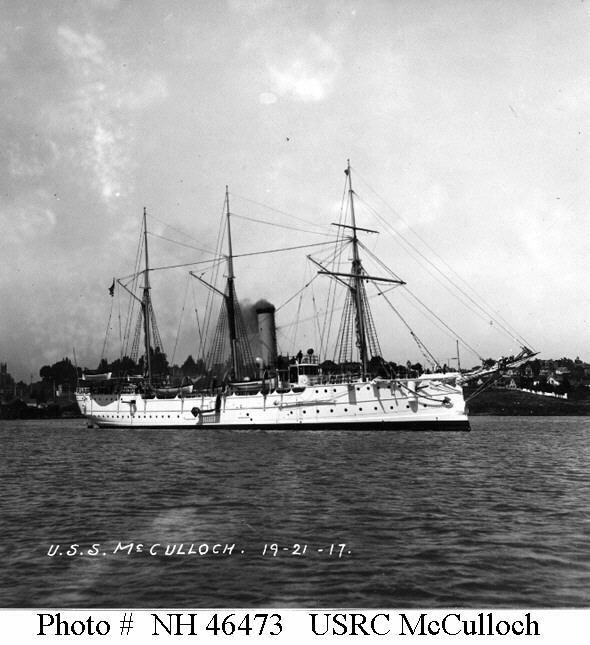 As the fastest ship available, McCulloch steamed for Hong Kong and its cable facilities to telegraph dispatches. (Crew numbers and list of names below). 10 January 1899 - Arrived at San Francisco. 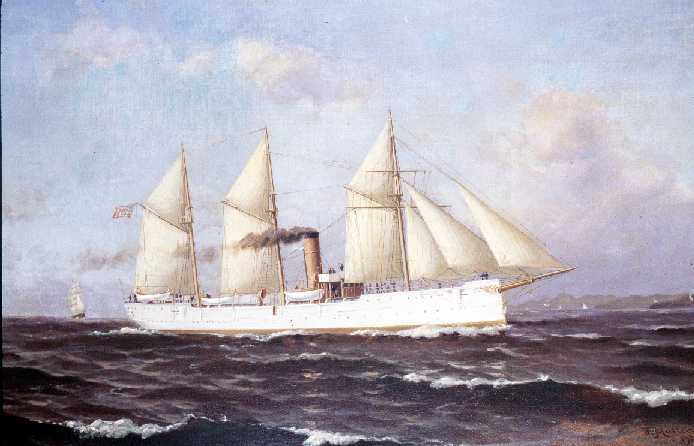 1899-1906 - Operated out of San Francisco, patrolling from the Mexican border to Cape Blanco. 1906-1912 - Patrolled Pribilof Islands area to enforce seal regulations. During this time with the Bering Sea patrol, served as floating court for Alaskan towns. 1912 - Returned to San Francisco and continued West Coast patrol duties. 6 April 1917 - Transferred to US Navy, continued Pacific coast patrol operations. Fate: 13 June 1917 - In collision with Pacific Steamship Company's SS Governor, sank 3 miles NW of Point Conception, Ca, NW of Los Angeles. One crewman lost (Acting Water Tender John Arvid Johansson, USCG, who was injured and died in hospital, San Pedro), all other hands saved. Right - "Neptune Claims a Good Ship"; newsprint image, U.S. Coast Guard magazine 13, No. 11 (September, 1940). This image appears to show only one mast abaft the funnel compared with the two in the other images. However, it may be possible to make out a collapsed mast just by the funnel. 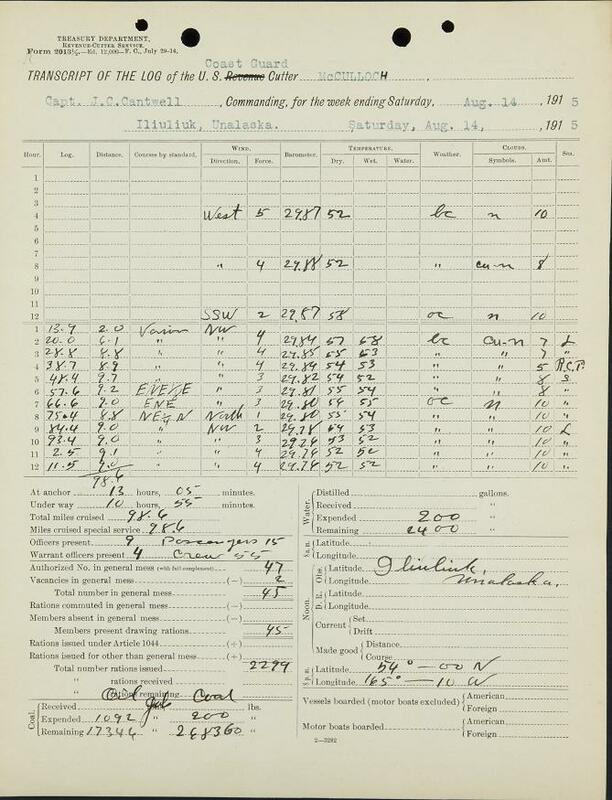 Left and right - log book page for 14 August 1915, at Unalaska.